My postdoctoral research project, titled A Media Archaeology of Drones: Television in the Army, 1930s-1940s, aims at unearthing the military uses of television during World War II and at resituating the developed devices and implied actors within the media’s broader historiography. 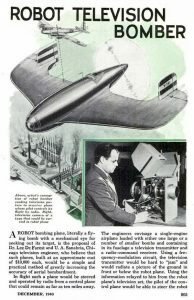 It pursues therefore the double goal of reflecting upon the first experiences of tele-guided planes and bombs from a media historical perspective, and of contextualizing these developments in relation to industrial research on consumer electronics. Providing historically informed research on the “pre-history” of drones, my project finally ambitions to intervene in contemporary debates on Unmanned Aerial Vehicles (UAVs) conducted in- and outside academia. Although prominent thinkers like Paul Virilio and Friedrich Kittler have underscored the historical and epistemological links between war and media, media scholars seldom paid close attention to the military as an actor in media history (Virilio 1989; Kittler 2010). This observation is particularly true for Television Studies: in television historiography, the years between 1939 and 1945 remain a black hole figuring as an unexplored parenthesis in historiographical accounts. Investigating the forgotten war-years, my project fills in a gap in historical knowledge and seeks to reconsider historiographical narratives on domestic television in the light of the media’s applications in wartime. I aim to make visible the transfer of scientific knowledge, engineering practices, and new technologies from commercial televisual research to the military domain, and back. To do so, I focus on the American leader in civilian and military television research, the Radio Corporation of America (RCA). From the mid-1930s on, RCA prepared to launch a national broadcast service while simultaneously producing lightweight close-circuit TV devices installed on military vehicles. Involved in numerous war-related projects by the Navy and the Army, RCA developed televisual equipment for target and assault drones, as well as gliding bombs: at RCA, television as a means of mass communication and of mass destruction originated in the same labs. Excavating these activities and their links with commercial work conducted in the corporation’s laboratories during the 1930s and 1940s, I seek to highlight the historical inextricability of civilian and military media technologies and uses. The methodological framework for my project is nourished by a media archaeological approach, understood as a way to renew historiographical methods and to “read against the grain” of established historical narratives (Parikka 2012). Attentive to forgotten, obsolete or repressed media forms, and underlining the interdependencies of discursive and material histories, the media archaeological perspective continually draws upon the contemporary moment to investigate the past, overlapping temporalities in order to create new historiographical narratives (Zielinksi 2006; Elsaesser 2016). Such a “multi-temporality” is crucial to understand the history of military television, where the dynamics of war-related production in the early 1940s converge with the rhythm of industrial research on consumer electronics, the hopes and resistances encountered by the introduction of television in the living room, as well as with biopolitics and colonial modalities of warfare at the present moment. This project is supported by the Swiss National Science Foundation.